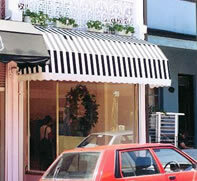 Ozsun canopy awnings are custom made from clear anodised, extruded aluminium which has been bent to the shape required on a bending machine. 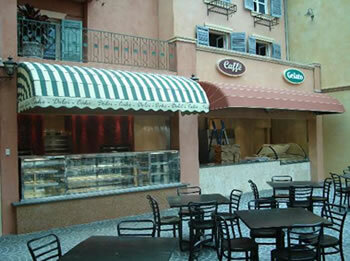 They are usually made as a fixed awning but can also be made retractable. The individual frames are assembled together with high quality fittings. Experienced craftsmen fix the required fabric to the frames with stainless steel staples. The staples are then hidden with a plastic cover strip. The cover strip will be toned in a colour to the fabric if no colour is specified. If the completed awning is small enough to transport, it is completely finished in the factory; otherwise it is finished in sections which are transportable for final assembly by the installers on site. The designs possible are only limited by your imagination. The types illustrated are intended as a guide. The most common are the traditional Dutch canopy shown below and the semi circular Cupola canopy shown above. 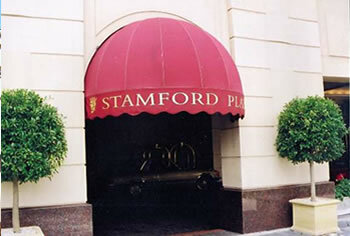 It is possible to put any awning fabric on canopy awnings, however retractable types should have acrylic type fabrics for appearance retention in use. Ozsun canopy awnings are very popular at the entrance to shops, restaurants, hotels and other commercial buildings as they can be sign written, and with backlit fabric and internal illumination they are very impressive at night and serve as a sign to the establishment. 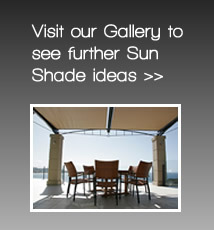 Ozsun canopy awnings are popular as a shading device over windows, entrances and patio areas around homes. Most of the designs available lend themselves to traditional architecture, although the wedge canopy looks good on contemporary style buildings.